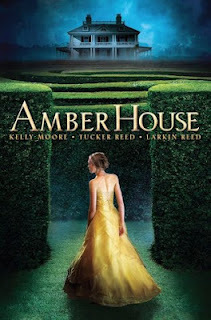 Description: Sarah Parsons has never seen Amber House, the grand Maryland estate that's been in her family for three centuries. She's never walked its hedge maze nor found its secret chambers; she's never glimpsed the shades that haunt it, nor hunted for lost diamonds in its walls. "The voice belonged to my mom, remembering all of a sudden that she was a mom, and therefore supposed to keep track of her child. If she spotted me, she'd ask me to do the track keeping. And I'd already done enough of that for the moment." "The play of light on the moving leaves made it look almost as if someone crouched there in the darker shadows. But the limbs of the bushes danced again in the breeze, showing it was just an illusion." "Way to rep the Hebrew people," I told her. "I'm pretty sure tats aren't kosher. Does the rabbi know? Never mind that, does your mom know?" I absolutely adore the cover of this one, the colours are so beautiful and it's definitely a book that I would stop for. Love that there are creepy parts to the book and some great twists and turns. Sounds really intriguing!